BUHERA, Zimbabwe, Apr 29 2016 (IPS) - Emaciated and with their ribs jutting out, Evans Sinyoro’s cattle lie on the ground overlooking a dry patch of land while the small earth dam nearby is also dry, thanks to the El Nino-induced drought wreaking havoc across Zimbabwe. El Niño is a complex weather pattern resulting from variations in ocean temperatures in the equatorial Pacific. Sinyoro hails from Buhera, a district in Manicaland province, which has not been spared by the marauding drought that has taken a huge toll on cattle across this Southern African nation. “I had 27 cows, 24 of which have already perished because of lack of drinking water and grazing pastures,” Sinyoro told IPS. El Nino has also not spared millions of people here who have fallen prey to worsening starvation in the face of drying up of water bodies and boreholes, resulting in many people like Sinyoro having to endure walking very long distances just to fetch water for domestic use besides watering their remaining fast dwindling herds of cattle. “While we have to strive to get water for our cattle, we also have to struggle walking over 9 kilometres here to find water for domestic purposes,” Sinyoro said. Women in the countryside have been the hardest hit by the El Nino-induced drought. “We have to wake up early mornings daily to walk to find water with our children so that they can bathe before going to school. We often have to store to bathe later because we get the water the hard way,” Madeline Chishamba, a 47-year old mother of four from Buhera, told IPS. Zimbabwe’s cattle herd is also a helpless victim of the El Nino-induced drought, according to agricultural experts. “Daily on average, only here in Buhera, we profile cases of approximately 20 or 30 cattle dying owing to lack of grazing pastures and drinking water, a situation that we can say is threatening to wipe out the country’s cattle herd,” Neverson Mutero, an agricultural extension officer, told IPS. Through the UN Central Emergency Fund (CERF), the Food and Agricultural Organisation of the United Nations (FAO) says it has made interventions to rescue the country’s cattle herd. “FAO’s drought-response projects that have been funded to date target the livestock sector, assisting vulnerable families to safeguard their livestock assets – and thus their food security – during the drought,” Leonard Makombe, communications officer at FAO, told IPS. Zimbabwe’s division of livestock and production development says that cattle have died mostly in areas like Masvingo, Matabeleland north, Manicaland, Midlands and Matabeleland south provinces. Masvingo province tops the list, besides the failure of crops there, with 6,566 cattle succumbing to the El Nino-induced drought, according to the ministry of agriculture. In total, this southern African nation lost approximately 16,000 cattle. According to the agriculture ministry, Zimbabwe is experiencing its worst drought since 1992 when it killed over one million cattle. In Manicaland’s Chipinge and Buhera rural districts, cattle prices have sharply fallen to as low as US$ 50 a beast, the worst cattle price fall in Zimbabwe’s history, this despite the cattle normally selling at $400 to $500 per beast. The devastation of the country’s cattle comes at a time when many people have always depended on it to generate income and for draught power. 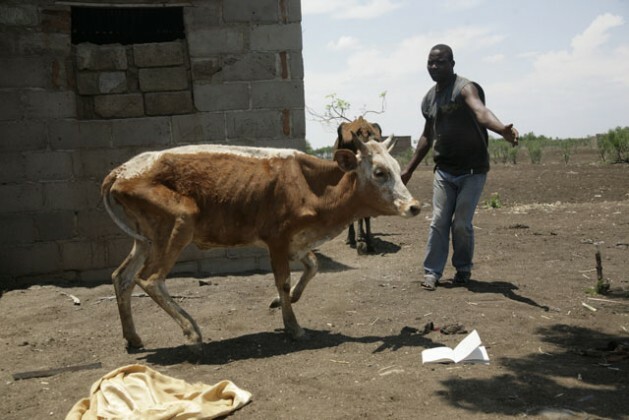 Now stung with the desperation to survive, and more so, stricken with hunger, Zimbabweans like Chishamba have resorted to barter trade using their dying cattle in order to get mealie-meal. “We can’t be spectators of our own cattle perishing; we would rather exchange the frail beasts for a mealie-meal, getting 50kg of maize for one beast,” said Chishamba. Thanks to FAO, some cattle farmers here are being bailed out of the crisis. “FAO is currently implementing two drought-response projects targeting small-scale irrigation, commercialisation of the livestock sector, improved nutrition, livelihoods and food security,” Makombe said. At least four million Zimbabweans are currently in need of food aid according to the United Nations World Food Programme (WFP). A drought worsened by El Niño has also rocked South Africa, Malawi and Zambia. According to the UN WFP, 14 million people in southern Africa are faced with growing starvation owing to the El Nino-induced drought, with South Africa this year recording its worst drought in history and for the first time after several decades set to import half its average maize crop. Early February this year, Zimbabwe’s vice president Emerson Mnangagwa went on record in the media saying US$1.5 billion was needed for the emergency importation of food and to fund other relief programmes. According to this southern African nation’s ministry of agriculture, 1.4 million tonnes of the staple maize grain will need to be imported to see the country through to the next harvest in March 2017. Failing to contain the drought, Zimbabwe’s President Robert Mugabe on Feb 4 this year declared the 2015-16 agricultural season a national disaster. But many farmers feel little has been done to save their cattle. “Yes, we are beginning to receive food aid from donors and government, but our cattle are dying due to lack of water and grazing pastures,” Sinyoro told IPS. Although many like Sinyoro are yet to receive help for their El Nino-hit livestock, FAO has already intervened with $1 million worth of stock feeds for supplementary feeding in this southern African nation.